The more we think about Tim Burton's new stop motion animation, 'Frankenweenie', the more we enjoy it. Opening the 56th BFI London Film Festival, it is now on release in UK cinemas. To celebrate that, Disney have put together a small but excellent exhibition taking visitors behind the scenes of the new film. Pictures and more information below. Situated by the BFI Southbank near Waterloo, 'The Art Of Frankenweenie' is a ticketed exhibition but is pleasingly free of charge. (Hat tip to American Express for that.) It isn't necessary to have seen the film before visiting, nor are there any major spoilers for the film should a visitor not have seen 'Frankenweenie' before attending. But considering 'Frankenweenie' is a rather charming horror spoof, we recommend seeing it immediately. 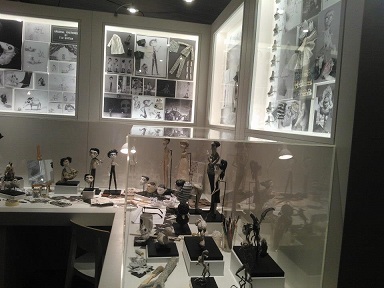 The exhibition showcases props, models, puppets and sets from the film - as well as storyboards, sketches and other 'Frankenweenie' photos. "Making of" footage appears by the side of some of the cases to help understand just how much of a painstaking process stop-motion animation can be - it generally takes one animator a whole week to create just 5.8 seconds of animation! This is continued further in the cinema space provided. 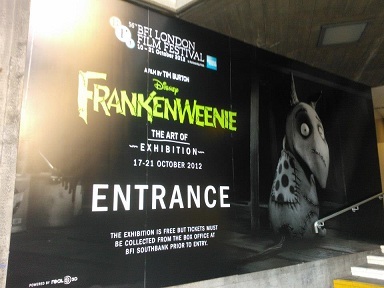 For the visitors who are yet to see 'Frankenweenie', they can view a trailer of the film in 3D - glasses provided. Better yet, anyone can have their photo taken peering into the science classroom set, which is printed out and encased in a small booklet to take home. Again, free of charge. It's a nice touch, particularly for children who may have been dragged unwillingly to the exhibition by their parents - who correctly hope they'll be wowed by the magic on offer. A bit more by way of interactivity would have been welcome, although there are helpful and informative staff on offer. 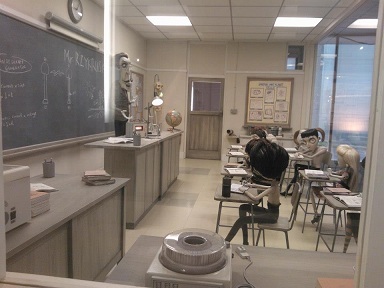 They're happy to explain what's going on in the sets in case any visitors haven't seen the film, and equally well versed in delving into the production and design history of 'Frankenweenie'. 'The Art Of Frankenweenie' unfortunately closes on Sunday (last entry at 19.30), co-inciding with the end of the 2012 London Film Festival. Well worth a visit but a must-see for any 'Frankenweenie' fan, equally so for anyone interested in stop-motion animation. The touring exhibition continues around the world when it leaves London, watch the embedded YouTube video above for further details. 'Frankenweenie' is out in UK cinemas now. For more photos from The Art Of Frankenweenie, visit facebook.com/fadedglamour.